Some worlds are better left alone. Infinity Fowler has been fighting all her life, both for survival and professionally. When humans obtained the technology to bridge to alternate versions of Earth, she signed up to become a bridger—an elite fighter and survival expert who protects tourists bridging to alternate worlds. Desmond Weaver is a tourist making a last-ditch effort to complete his PhD. He has booked a data collection mission to a vastly different version of Earth. If he fails, his career will be over. 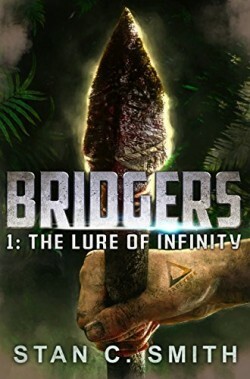 Infinity is Desmond’s assigned bridger. She is the best, willing to die protecting tourists. When it’s time to bridge, Desmond and his two roommates feel well prepared. But they aren’t. Naked and weaponless, on an extraordinary world teeming with lethal predators, the team becomes entangled in a life-and-death struggle more terrifying than anything they could have imagined.